The hotels in Georgetown are among the most elegant and memorable places to stay in Washington DC. With their prime location, most of them are within walking distance to many fine restaurants, shops and historical attractions. Properties range from large 5-star hotels to small boutique-style inns to family-friendly suite-style accommodations. Here is a guide to the hotels in Georgetown. 2500 Pennsylvania Ave NW, Washington, DC. (202) 333-8060. Avenue Suites offers contemporary upscale suite-style accommodations in an ideal setting in the heart of the city. 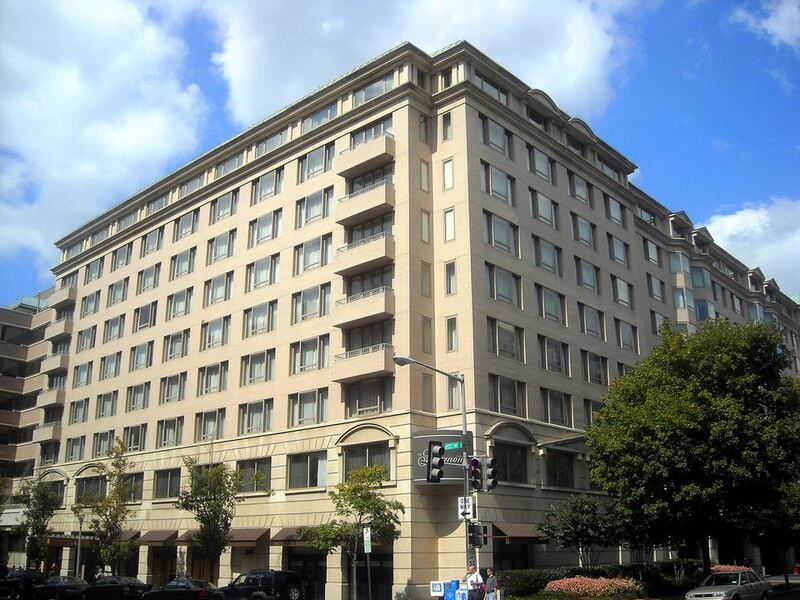 The property is within walking distance to the National Mall, and just two blocks of Georgetown. Each spacious suite offers state-of-the-art kitchens, work desks, Keurig coffee-maker, and complimentary high-speed internet access. 1050 31st St NW Washington, DC (202) 617 2400. Located in the heart of Georgetown along the historic C&O Canal, the boutique hotel offers easy access to museums and galleries, specialty shopping and unique dining options. Amenities include a rooftop lounge and infinity pool, spa and fitness services, and stylish meeting and event venues. 2401 M St NW, Washington, DC (202) 429-2400. Located in Washington’s West End and adjacent to historic Georgetown, the luxury hotel offers 415 spacious guest rooms and suites, a fitness center, indoor pool and expansive meeting space. 2800 Pennsylvania Ave NW, Washington, DC (202) 342-0444. The five-star hotel with its prestigious location, offers prime access to the best shopping, dining and entertainment in the nation’s capital. 1310 Wisconsin Ave NW, Washington, DC (202) 333-8900. The elegant inn has 96 rooms in the heart of Georgetown, close to shopping, entertainment, and all the sights of Washington, DC. 1111 30th St NW, Washington, DC (202) 298-7800. The all-suite hotel offers spacious accommodations with full kitchens and free wireless internet connections. All rates include complimentary continental breakfast. 1000 29th St NW, Washington DC (866) 332-2590. The 3-star hotel features in-room kitchens, free internet connections along with a state-of-the-art fitness center, and daily complimentary continental breakfast. 1075 Thomas Jefferson Street NW Washington, DC (202) 337-0900. The 57-room luxury hotel was renovated and rebranded in 2013. The addition of two brand new dining venues includes a sleek new restaurant and cocktail lounge and a rooftop bar with sweeping views of Washington DC. 2430 Pennsylvania Ave NW, Washington, DC (202) 955-6400. The Melrose is a 4-star boutique hotel with a prestigious setting just steps from Georgetown and the Foggy Bottom Metro station. Recently renovated, the hotel has a sophisticated design and offers large guestrooms and deluxe suites, a modern fitness center, valet parking, and more than 5,000 square feet of meeting and event space. 1201 24th Street, NW Washington, DC (202) 789-1234. The 216-room luxury hotel, located a few blocks from Georgetown, offers upscale amenities including a sky-lit indoor swimming pool and whirlpool, 24-hour fitness center with state-of-the-art cardiovascular and weight equipment and full in-room spa services. The Park Hyatt’s Blue Duck Tavern is an award-winning restaurant with an open kitchen featuring the region’s freshest produce. 3100 South Street NW, Washington, DC (202) 912-4175. Housed in a converted industrial incinerator building, the luxury hotel, with its lofted ceilings, offers a cozy, intimate hideaway, in the heart of the nation’s capital. The property is within walking distance to unique shopping, fine dining, nightlife and the Potomac River waterfront. 2505 Wisconsin Ave NW, Washington, DC (202) 337-9700. Located in Glover Park near the upper end of Georgetown, the hotel has easy access to the National Cathedral, Dumbarton Oaks, the U.S. Naval Observatory and is just a few blocks from Wisconsin Avenue, M Street, and the Georgetown waterfront. A complimentary shuttle is available to and from the Woodley Park Metro Station, Georgetown University, American University or Georgetown University Hospital. 2350 M St NW, Washington, DC (202) 429-0100. The luxury hotel combines elegant accommodations with state-of-the-art amenities including an outdoor pool, fine dining restaurants and extensive meeting spaces. Looking for more information to plan your trip? See a complete Washington DC Travel Planning Guide with tips on the best time to visit, how long to stay, what to do, how to get around the region and more.